After being blacklisted from Hollywood for 21 years, writer/director Abraham Polonsky made a healthy comeback with Tell Them Willie Boy is Here. The title character, played by Robert Blake, is a Paiute Indian living in 1909 California. After several years in the White Man’s world, Willie Boy returns to his reservation, hoping to renew his romance with tribeswoman Lola (Katherine Ross). Old Mike (Mike Angel), Lola’s father, strongly disapproves of her relationship with Willie Boy and attacks the youth. Acting in self defense, Willie Boy kills Old Mike. Under tribal rules, Willie Boy is now permitted to claim Lola as his woman. But white lawman Christopher Cooper (Robert Redford) is forced to charge Willie Boy with murder. The Indian and his girl escape the reservation, pursued by the essentially decent Cooper and a less-than-decent crowd of white vigilantes. What begins as comparative minor incident, snowballs into a huge political crisis, with the bewildered but defiant Willie Boy as the catalyst. 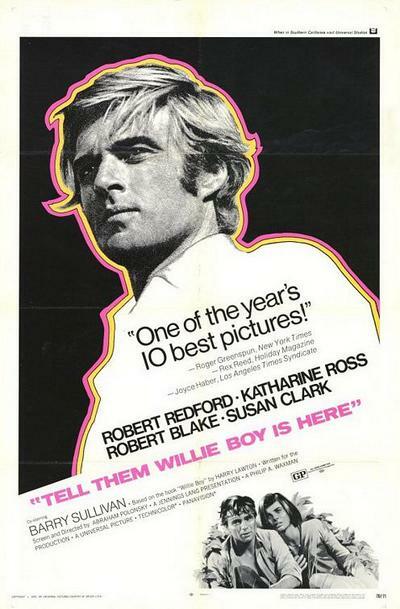 Tell Them Willie Boy is Here is distinguished by the fine performances of leading players Redford, Blake, Ross and Susan Clark, and by the haunting cinematography of Conrad Hall.